Most Canadian cultural historians view the 1960s as the decade when Canada came of age as a vital, dynamic, forward-looking nation. In addition to the broader social and technological changes occurring throughout the Western world, Canada’s icons of the era—Expo 67, the maple leaf flag, Marshall McLuhan, Pierre Trudeau—symbolized a country transcending its largely conservative, colonial past for a shiny new future where almost anything seemed possible. The 1960s were a similarly transformational time for building in Canada, as architects synthesized global design influences with local geography, climate and culture to create a fresh and dynamic Canadian architecture. 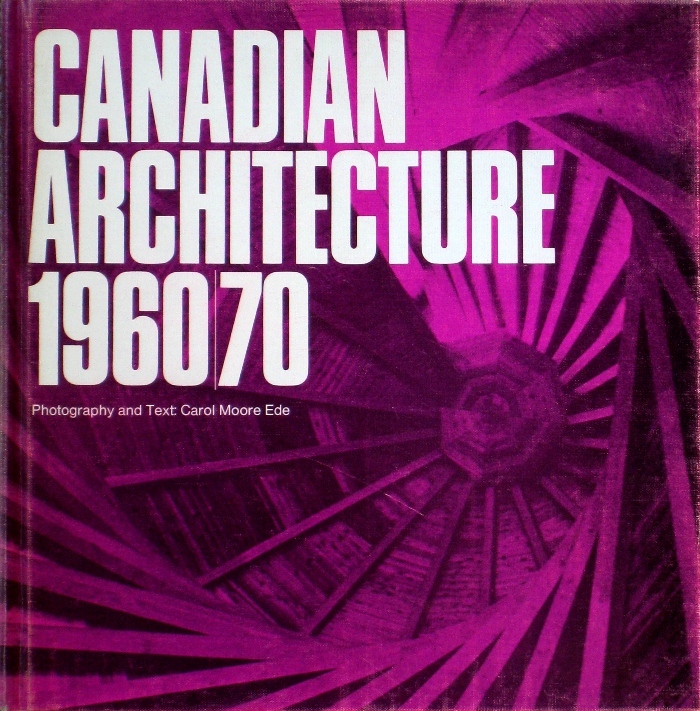 This pivotal period is captured in the 1971 book Canadian Architecture 1960/70, written and photographed by Carol Moore Ede, then a young CBC television producer, director and writer. The sizable 264-page hardcover documents 24 Canadian-designed buildings from Vancouver to Charlottetown and profiles their respective architects. When preparing a survey of the immediate past, the challenge is selecting the subjects: what will stand the test of time and what will soon be dismissed as a regrettable diversion? Forty years after the publication of Canadian Architecture 1960/70, it’s remarkable how closely Moore Ede’s choice of buildings parallels what is regarded today as the canon of Canadian architecture in the Sixties: Arthur Erickson’s Simon Fraser University, Smith Residence and MacMillan Bloedel Building; Ron Thom’s Massey College, Trent University and Fraser Residence; Moshe Safdie’s Habitat; Douglas Cardinal’s St. Mary’s Church; John Andrews’ Scarborough College; Raymond Moriyama’s Japanese-Canadian Cultural Centre; Étienne Gaboury’s Church of the Precious Blood; Clifford Wiens’s Lady of the Lake Chapel and University of Regina heating and cooling plant; Affleck, Desbarats, Dimakopoulos, Lebensold and Sise’s Place Bonaventure and Confederation Centre of the Arts; and others. Two arguable omissions of note are John B. Parkin Associates’ Ottawa Station and Macy DuBois’s Central Technical School Art Centre. A clean, crisp design by Burton Kramer Associates, complete with reproductions of the original architectural drawings, makes the book an attractive object itself, although the photographic quality is somewhat compromised by the low-gloss paper stock. Pushed aside by Post-Modernism in the 1980s and early 90s, Canada’s Modernist architecture has since been embraced not only as a cultural legacy, but also as an inspiration for subsequent generations of architects. Canadian Architecture 1960/70 is a key document of the nation’s architectural past and is still a worthy point of departure for its architectural future.